Elizabeth and Paul Manyok with Sammie Griffin in 2012. If it wasn’t for Paul Manyok and his family, Sammie Griffin might not be as heavily involved with Habitat for Humanity as she is today. But, like many of Wells Fargo’s volunteer team members, she found there are certain families whose stories have stayed with her and who inspire her to continue helping others. Griffin is one of thousands of Wells Fargo team members who have volunteered with Habitat for Humanity and other organizations as the company worked toward Wells Fargo’s 2020 commitment to build and improve 1,000 homes for low-income homeowners, seniors, veterans and families. More than two years ahead of its deadline, Wells Fargo has met its goal, surpassing 1,000 homes at the end of 2017. Since 2010, the Wells Fargo Housing Foundation has donated more than $48 million to local Habitat for Humanity affiliates, as well as Habitat for Humanity International. Wells Fargo team members have volunteered on a Habitat for Humanity home equivalent to every day for seven consecutive years. 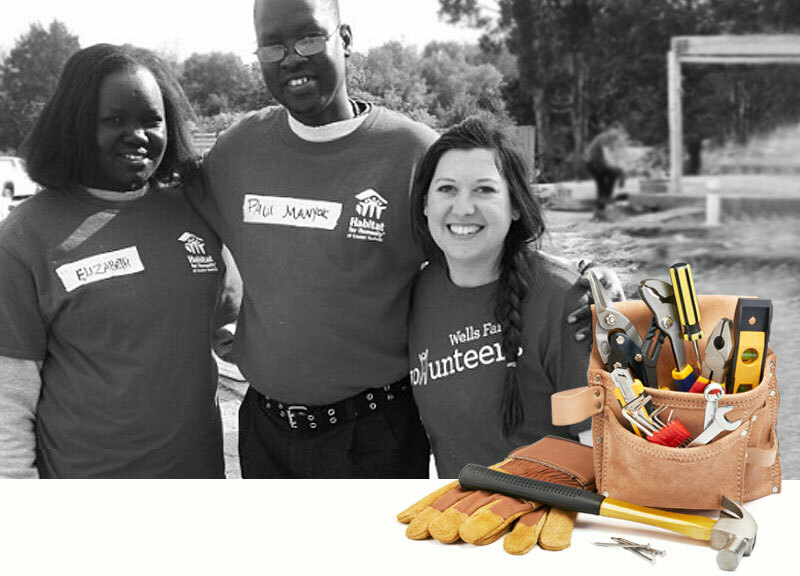 Among the leading providers of volunteers to Habitat for Humanity, Wells Fargo team members have volunteered more than 355,000 hours since 2010 to build and improve more than 2,400 Habitat homes for low-income homeowners, seniors, and veterans. Griffin, a sales analyst for Wells Fargo Treasury Management, first volunteered with Habitat for Humanity when she moved to Nashville, Tennessee, in 2012. At the time, she worked on the same floor as a team member who recruited and coordinated volunteers for the global nonprofit housing organization. Griffin decided volunteering with Habitat and helping to recruit other volunteers would be a good way to get involved in the community and meet fellow team members. For Paul Manyok, the connection was mutual. One of the Lost Boys of Sudan who left their homes to escape war and genocide, Manyok lived in Ethiopia and Kenya before coming to Nashville in 2003. After graduating from Lipscomb University in 2011, he was living in an old apartment with his wife and three children and working as a community services officer with Vanderbilt University Medical Center when he applied for and was approved to purchase a four-bedroom house from Habitat for Humanity of Greater Nashville. Over the years, Griffin has increased her involvement with Habitat for Humanity. Since 2013, she has been a volunteer recruit for the organization. In 2016, she interned with her local Habitat’s board of directors and was invited in 2017 to join its advisory board for a three-year term. Griffin joins almost 90 other Wells Fargo team members who serve on boards for local Habitat for Humanity organizations. She has also served on the Homeowners Selection Committee since 2017, participating in home visits for applicants. Since then, Griffin and Manyok have stayed in touch and discussed Griffin bringing her son to the Manyok house sometime soon so their families could meet. Six years after they first met, their connection remains. “I love that this wonderful family is a part of my story now,” Griffin said.